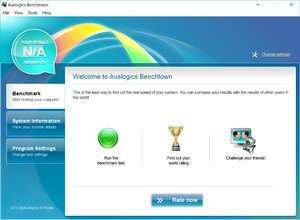 Auslogics Benchtown is a freeware benchmarking program which can test your PC to its limits, giving you an idea of where you stand when you compare your computer power to others who have posted their results using the Benchtown pram. Results of your benchmarking tests will be posted on the Benchtown web site where you're able to browse through the results of several aspects of your PC's performance such as CPU rating, RAM, Hard Drive(s), 3D and 2D graphics and more. Perfect for gamers and power users alike. For security reasons, you should also check out the Auslogics Benchtown download at LO4D.com which includes virus and malware tests. Additional screenshots of this application download may be available, too.